Jimmy Graham was targeted 27 times in his last three games. 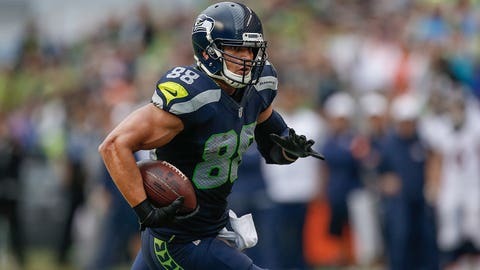 Tight end Jimmy Graham appears to have found his role in the passing game as the Seattle Seahawks enter their bye week at the season's halfway point. Seahawks coach Pete Carroll attributed the increased productivity of Graham to an improved working relationship with quarterback Russell Wilson. Graham, acquired in a blockbuster deal with the New Orleans Saints in the offseason, was among the league's top offensive threats before his arrival in Seattle. He had at least 85 catches in each of his last four seasons with the Saints, scoring 46 touchdowns in that span. While he scored twice in his first three games with the Seahawks, Graham also failed to eclipse 30 yards receiving three times during the first five weeks. Things started to change in Week 6 as he had eight receptions for 140 yards and added seven catches on 10 targets in Sunday's win at Dallas.